January 20 was an uncomfortable day for many people, myself included. Not wanting to focus on the ‘changing of the guard’ in Washington D.C., and recovering from my second bout of flu/cold virus, I did not want to feed myself, or the universe, fear and negativity. I’d had enough of that. So I went to the woods. A peaceful walk down our trail ended in a place where I often offer prayer. I poured out my heart to the Divine above and the Earth below. Part plea, part invocation, I felt heard in that somewhat quiet place, with Nature as my only witness. Turning around, I was enchanted, as always, by the winter sun filtering through the open canopy of a mixed conifer and deciduous forest. The bare branches of giant, aptly named, Big Leaf Maples allow the low, side-ways sun to flood places shrouded in shady tones under the summer canopy. This light will eventually awaken the first signs of wild bleeding hearts, nettles, and other early spring plants, which will thrive until the Maples block the light. 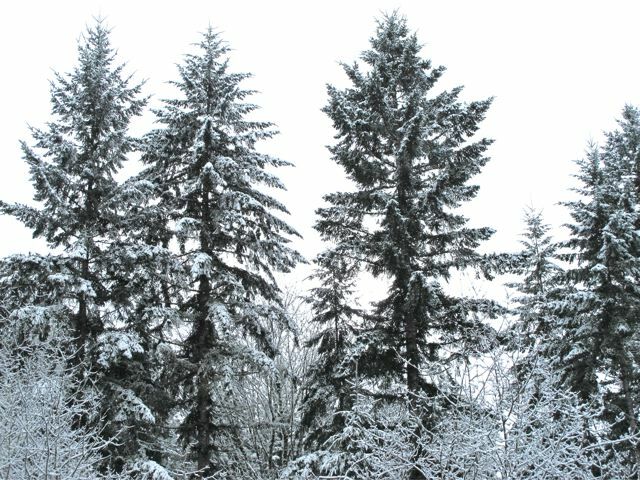 But it is early, and the winter has been exceptionally cold for the NW. Here on our hill the ground was frozen with heave and ice crystals from mid-December until just last week. No signs of spring in the woods…but signs of survivors. Impressive are the tender leaves of little-green-plants-whose-names-I-forget that are fresh and green, while others around them succumbed to weeks of being frozen. The peacefulness I was feeling as I stooped to photograph the brilliant green glistening water of a wintertime mini-pond was rudely interrupted by loud repetitive gunshot. For the past few years we have been hearing gun shot frequently. A gun enthusiast seems to spend his free time on holidays and weekends shooting whatever, somewhere across the street from where we live. But this was closer, and louder. After a minute or so of repetitive shots, there was a long volley, and then it stopped. I suspect it was a celebration salute to the moment of transition in D.C.
My moment of woodsy peace was broken. Abby was gone, though I didn’t see her leave. Though I wanted to make a mandala in the woods, I reluctantly walked back to the house to find a shaking dog on the front porch. Not willing to go inside myself, mandala making took place on the back porch, with whatever I found close at hand. “survivor” carrots, minus the big ones I ate and the ones in the mandala! The biggest surprise find was the carrots. I noticed them when the ground first froze and heaved back in December. Left behind when I dug out our two little rows in the fall, the frozen ground had pushed them up, but also held them tight. I wrote them off as frozen food, soon to be mush when the thaw came. I forgot about them as I struggled through December into the New Year being sick. Frozen carrots in frozen ground were not on my mind! But on this sunny day, there they were, brightest color around, freshly washed from the rain, half out of the ground, green tops long gone. They stood like little round-topped, slightly tipsy sentries, and not the least bit mushy! About a dozen carrots, most small, edible, and tasty! I made my mandala and thanked Mother Nature for giving me a small, somewhat humorous sign, that “we can survive” (and even be bright and colorful doing so!). The next day, as millions marched peacefully throughout the world, I have no doubt we will! A medicine mandala for hope, with anti-viral and anti-bacterial usnea, leaves of pain-relieving fever few, another survivor of the below freezing temperatures. How did you survive inauguration day? the view on these frosty 24 degree mornings! New day, New Year. Mike and I both having a second go around of a winter bug. Yesterday was Mike’s day of misery, which I was hoping to avoid it, but today Mike is better and I’m miserable (those who’ve had this bug know the misery!) and grumpy, so grumpy Mike called me a professional grump! 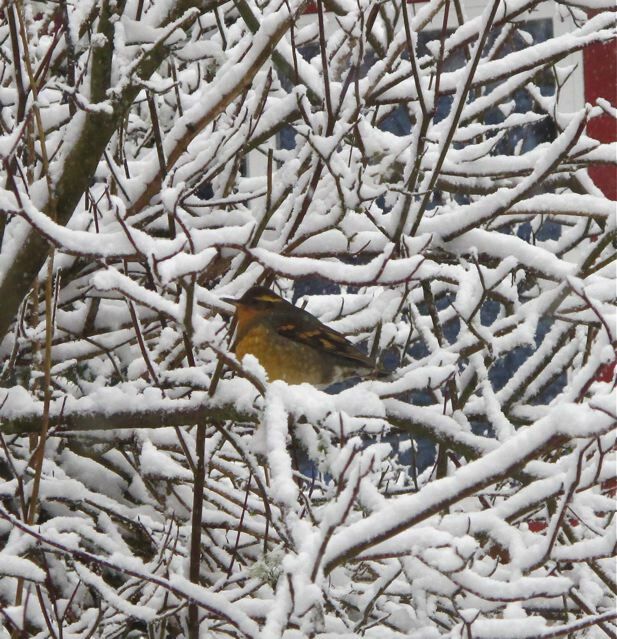 The peach tree out my window in winter frost and full of birds, all that is visible is a plump Varied Thrush. Yes, grumpy. I was hoping for a healthier start to the New Year. Last year began while I was recovering from a mastectomy, two years ago I was diagnosed with my first bout of invasive breast cancer right before New Year’s Eve. Lots of health challenges and surgeries over the years have given me more than my share of ‘sickly’ New Years! So the ego is grumpy, feeling like I’ve paid my “dues”. I wanted a year that started off relatively healthy, in spite of a painful, dysfunctional knee that has a torn meniscus. But as I lay in bed being grumpy, I’m also deeply grateful. Grateful for this view. Through decades of health challenges, through the seasons of life, through the seasons of the years, this view of trees….in mid-day sun, or swaying in the wind on a stormy day, or silhouetted in the moonlight… deciduous trees winter bare or green with new spring leaves, towering evergreens reaching for the sky, a flowering currant ablaze in hot-pink blossoms in spring, or it’s bare, red bark branches adding color to the winter landscape….fills my view. When I lay in bed I can watch birds and chipmunks eat the red berries and seek shelter in the Honeysuckle vines covering the garden gate trellis. Intertwined with pink roses in the summer……they add to a view alive with life, color, and seasonal change. If I open the window, I sometimes hear birds that fill the branches of the peach tree, or between the car noise on the road, the sound of stillness. The stillness is less and less, but it’s rarity makes it more precious. from my bed I only see the trees and sky. For over 35 years I’ve watched these trees grow, and watched some come down. It is not a ‘picture perfect’ view, not a ‘million dollar’ view…it includes the functional surroundings of our life…a duck coop, a rainwater tank, our trailer, and a garden sometimes lovely, often weedy, in the winter rather bleak. But is it still a window on Nature that keeps me sane when the body has kept me housebound. It is the view I stare at when life has overwhelmed me, when the mind is numb, when my thoughts don’t know what to do with themselves, except stare at the trees. And when I am feeling grateful. My 2016 resolution…. let gratitude grow like the trees out my window. Even the most challenged of lives has blessings. May your view in the New Year include seeing your blessings daily. Even when you’re feeling grumpy! 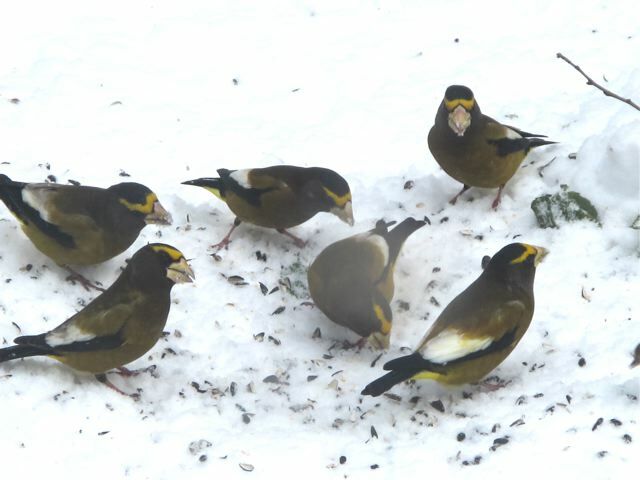 Picture taken through my window last year of our occasional visitors. For readers who may not live in the coastal Pacific Northwest…it’s raining out. Not just raining, November raining. The rain that spawns temperate rainforests of water-loving Sitka spruce, Western hemlock, Western red cedar, and Bigleaf maples, whose branches are covered with thick moss, holding the rain like sponges. It’s the type of rain that brings those gentle giants down by saturating the soil where their roots try to hold on while water pours into the earth, loosening even the hardest of clay soils, and moving in rivulets the rich peaty soils of the forest floor. In our small, old, house with 2×4 framing, thin-glassed old windows, and low ceilings, November rain is a pounding force to be reckoned with, an omnipresent noise, day and night. The barrier between the sheets of falling water and us seems a bit weak-willed. I review in my mind…how old is our roof? Did we leave any unfinished projects at any buildings that might have left even a crack where water could get in? How will the old chicken coop hold up? Everyone – us, chickens, ducks, are warm and dry…and for the most part staying indoors. And then it stops. Just when you think it will never stop, when it has rained for at least 48-72 hours, when the weather forecast says 90-100% rain every day in the foreseeable future, the faucet suddenly turns off, the darken sky lightens, and the world opens up. Going outside after the first good multiple-day November storm is always an awe-inspiring experience. Deciduous trees have lost nearly every last leaf (except our strange peach tree, which has never produced more than a few peaches, yet holds on to bright green leaves until Christmas). There is sky where there has not been sky since early the previous spring. The road noise, drowned out by the rain, is audible again, yet there is a silence when compared to the deafening water that has pounded, like the surf on a beach, and poured for hours. The rainstorm, washing away autumn, has given birth to winter. It is not the same stillness of the first snowfall, yet there is a tangible winter calm to the quiet that follows a robust rainstorm. Remarkably, with the winter solstice still a month away, darkness increasing daily, and the days continuing to get shorter, there are signs of spring. New buds have formed on the Indian Plum, and on the Flowering Current, which I guiltily pruned today, cutting off many tender buds. It is difficult in the northwest to find a ‘dormant’ time to hack away at plants. With the wet weather and mild winters, the dying back and the budding forth appear seamless in many perennial bushes and trees. Even some early perennial flowers have put forth new leaves, but it is a premature effort, for the first snow or a prolonged freeze will cause them to die back. It is the lull before the next storm, according to the weather pundits, a much-appreciated lull before feeling buffeted around again by stormy weather. 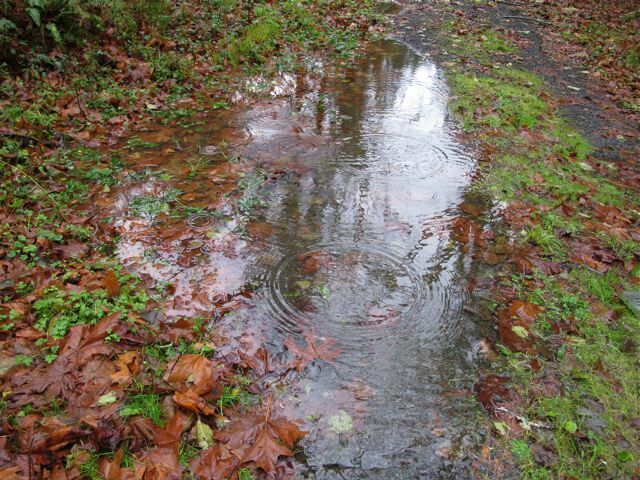 As this week of Thanksgiving, infamous for challenging weather patterns, begins, I am grateful to go out and work in the wet garden, breathing in the clean air as I prune back dead flowers, pull down soggy bean plants, cover the whitened, decaying squash plants with fallen Maple leaves, preparing the hills for next summer’s planting. An appreciated lull to put the garden to bed for the winter. Northwest weather is made for soup. I make a lot of soups. Here is one of my latest. Warming food for stormy weather! A nice pre or post-Thanksgiving meal, easy, not too heavy, but filling. 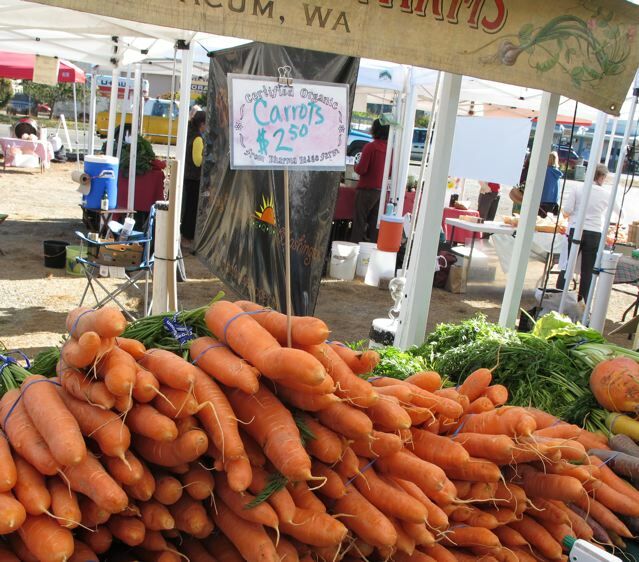 Dharma Ridge Carrots at the Chimacum Market. 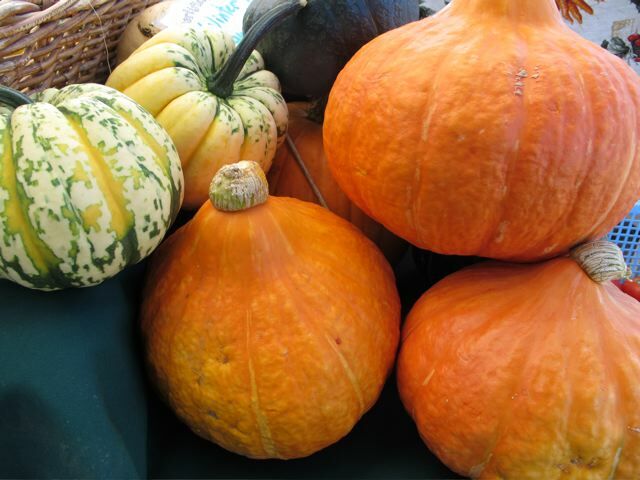 The Port Townsend Market is still open on Saturdays with lots of winter veggies from local farmers. Cook until rice is done. Put into a blender in batches to blend smooth. It will have little pieces of apple skin, for a smoother soup peel apple first. Options: I added homemade almond milk I had on hand, coconut milk is also nice, about 1/3 cup. 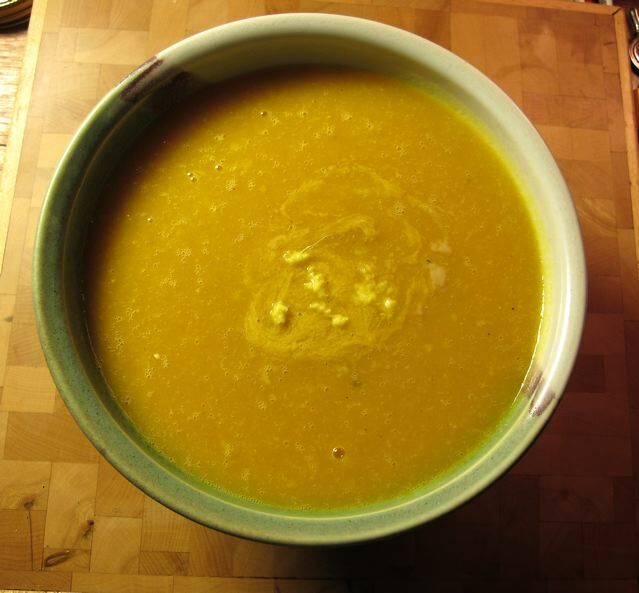 Garnish with a dollop of tahini and fresh grated ginger, the tahini adds protein, and a distinctive, richer flavor, but the soup is delicious, and a little lighter, without it. Ah, it is raining again. Think I’ll go make some soup! I am grateful you do me the honor of reading my musings! It helps keep my creativity alive! Cleaning up under a feeder, a small band of a much larger mob! Not much blogging on this blog lately. Difficult to share my musings about the joys and mysteries of Nature when for the past month Nature and I have not hung out much. Gimping around in a leg brace due to a fractured knee cap has made thiswinter an inside event. And I have certainly grumbled on the rare days of blue sky and sunshine, missing my winterwoods walks. Sitting in a lawn chair bundled up with my leg on a stool does notsatisfy the desire to be walking a beach to shake out the winter gray. But today Nature came knocking. After a tease of snow over the weekend, today is the promised “winter weather warning” weather pundits have been excited about for the past few days. 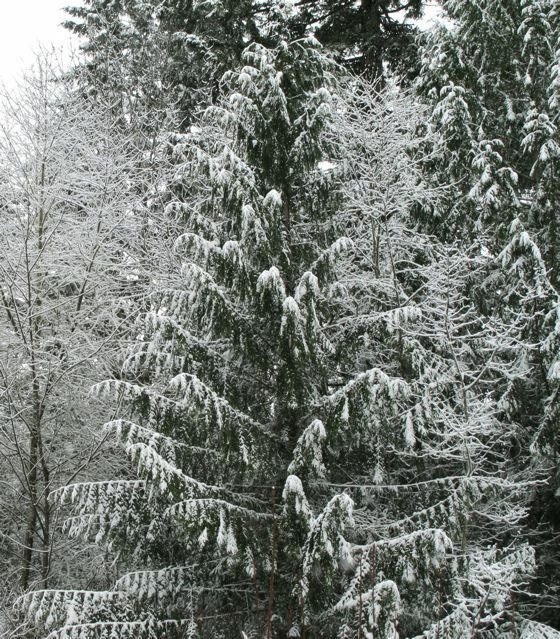 In urban areas snow in western Washington can bringdisruption and havoc, but here it is absolutely transformational. The noisy county road, slick with black ice under newly fallen snow, is almost abandoned. Only the brave, foolish, and critically needed venture north from south county. I sit mesmerized as the world around me becomes bright. Snow is falling and every little branch and ‘branchette’ heavy with mini snow piles. Birds of all shapes and sizes decorate every bush and tree in our yard as they take turns at the feeders. I toss out extra seed close to the house where there is still exposed dirt and grass, and the adventuresome wander unto the porch to see if I am providing extra feeding stations, which I do, as I cannot resist Curious Juncos, bold Stellar Jays, and flitty Towhees who find the competition at the feeders a hassle. Both Chickadee varieties and dozens of Pine Siskens compete for, and empty, the hanging feeders. Against the white, birds that usually blend in become colorful tree ornaments – StellarBlue, Thrush Orange, Towhee Brick Red & Black, the earth tones of Junco& Chickadee, Finch Red, and a plethora of Sisken Stripes! A Grosbeak just arrived, a young male with just a slight show of bright yellow. And there are all the antics that go along with the color show. Small Siskens are the bullies, and hang out in very large gangs. They open their tiny wings in a show of aggression and chase anyone else from af eeder. Towhees are theflitterers, hopping and bopping about on the ground. Chickadee darts in, procures one seed to take to a branch, opens and eats it – seems like more energy is expended than gained, but not being a Chickadee I don’t know. Jays, big and bold, spend a lot of time in the trees picking at moss andbugs and who knows what else. I just looked up as one ducked to avoid a mini snow avalanche falling from the branch above. Thrushes hunker down, making their elegant long bodies into large round fluff balls to stay warm. And there is the constant twitter and cooing, special sounds that are either only sung on snow days, oragainst the snow muffled silence take on a sometimes eerie, always charming,tone. Yup, Nature came calling today,drawing me out and captivating me with snowy enchantment. Stay cozy, and if you are living in a warm sunny earth place…ah you are missing the magic!